The Village of Montgomery has created a second Tax Increment Financing (TIF) District in January 2014. The Project Area, as depicted in the above map, is generally located by Orchard Road and Aucutt Road. Through the TIF creation process, the Village created a Tax Increment Financing (TIF) Eligibility Study. In addition to the Eligibility Study, the Orchard Road TIF District Redevelopment Plan and Program has been created to provide additional information on the district. 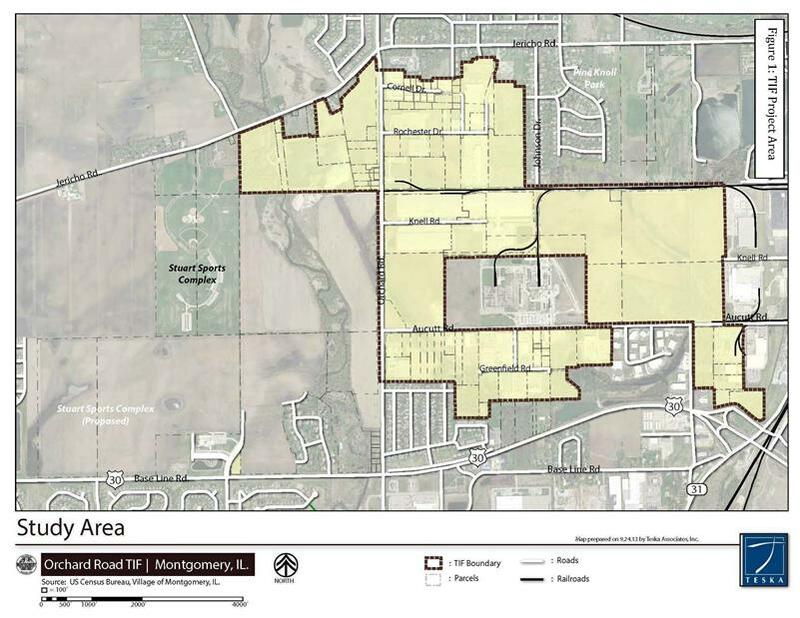 The Final Eligibility Report from Teska Associates, Inc. outlined recommendations on page 3 for qualifying the proposed TIF area as vacant land subject to chronic flooding and as an “industrial park conservation area”. Prior to the Village of Montgomery's effort to prepare the Tax Increment Financing (TIF) District Eligibility Study and Orchard Road TIF District Redevelopment Plan and Program the Village engaged in a Feasibility Analysis for the area along the Orchard Road and Aucutt Road corridors. The Village of Montgomery created a Steering Committee in 2012 comprised of Village staff, elected officials, and representatives of the Montgomery Economic Development Corporation’s (MEDC) Business Climate Enhancement Committee (BCEC) to assist with the initial feasibility study. Agendas and minutes from the meetings are available below.